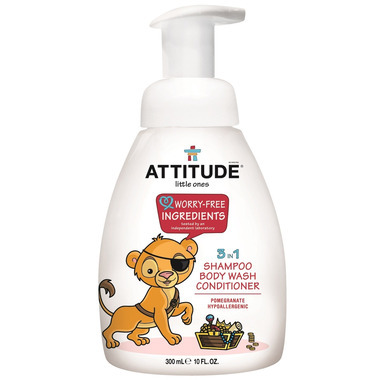 The ATTITUDE Pony brings with her an enchanted world comes bath time with this 3 in 1 Shampoo, Conditioner and Body Wash. With a sweet wild berry scent, hypoallergenic and natural ingredients, ATTITUDE contributes to your baby’s comfort and your peace of mind. Made with worry-free ingredients. Ingredients: Aqua, Decyl Glucoside, Coco Glucoside, Glycerin, Dicaprylyl Ether, Glyceryl Oleate, Citric Acid, Fragrance, Sodium Benzoate, Lauryl Alcohol, Potassium Sorbate. I liked this product a lot, easy to use with the pump and smells fantastic. My only complaint is that I wish it were a little more conditioning for my daughters tangly hair! Otherwise a great shampoo. Great product. Smells good. Environmentally friendly. All in one product. I like to conditioner aspect for my daughter's long hair. Most kid products don't have that. My granddaughter loves it. It cleans well, smell nice and does not irritate her eyes. Works great. Not an overpowering smell. Left my son's hair nice and clean and his skin clean and soft. No complaints! This is my favourite soap to use for the children (age 2 and 3). I love the light fresh smell too.